Upgrading a Netgear 3500L to the latest TomatoUSB build. This worked for me as of December 01, 2011 - with no guarantees that will work for you or at any other time. WinRAR or 7-zip or a related utility to unzip the RAR file. Some timer - either an app on your phone or a watch with a seconds hand. A pushpin of some sort. A printout of a document that looks something like this. A laptop or desktop of some kind that has a working modern browser. Ensure your firmware files are identified, available and ready to go. See above for the two files you need to keep available. Use WinRAR or 7-Zip to unzip the .rar file. You will get a .trx file along with a changelog. Rename the .trx extension to .bin. Connect your computer to the router using an Ethernet cable, if you do not have extra cords, use the one which used to connect the router to the external WAN. In either case, ensure the External WAN is disconnected. Perform a 30-30-30 reset using your push-pin on the depressed reset button on the back of the router. You might want to use the timer to ensure you are actually keeping it depressed for 30 seconds. Wait for the router to boot back up. Using your browser, head over to http://192.168.1.1, and use your default credentials login: admin and password: password to log in. 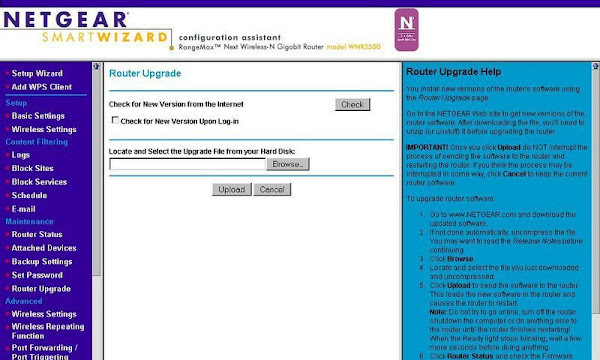 Using the Upgrade option on the Netgear admin menu, use the .chk file you downloaded from the DD-WRT site. Note you are not using the bigger TomatoUSB firmware yet. Wait, no seriously wait. Wait till the lights get back to normal. Wait. Wait to see that you can access the new admin interface. Perform the 30-30-30 reset. Wait for the router to come back up. Now head back over to http://192.168.1.1. You should be automatically logged in, but instead will be asked to set an admin account with password. You can set this to be whatever you want, your firmware is just about to be flashed. 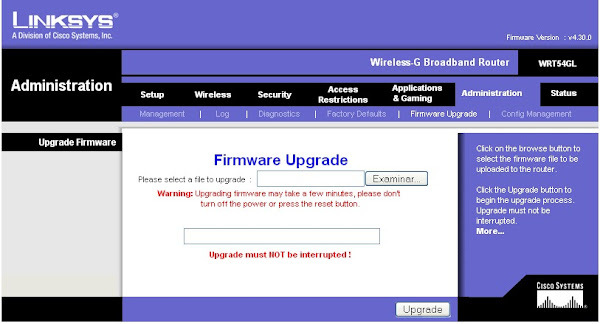 Go to the Administration tab and then Firmware Upgrade sub-tab. Select the TomatoUSB file that you extracted from the RAR archive and renamed to a .bin file. Again wait. For all the frenzy to subside. After you can see the router administration page again, wait some more. Perform another 30-30-30 reset. Wait for the router to come back up. Set up basic wireless services, located under. Disconnect the Ethernet cord, reconnect the router to the WAN network, get-up sit on the couch and continue configuring your brand new router firmware. And yes, keep away the push-pin, the timer and set your wired connection back to dynamic IP. That was it, and if you have been following along, my Toshiba thrive connects beautifully to the new router via SMB and I can now access all the media I have on my RAID, wirelessly over the home WiFi network. Cloud anyone? Freedom to hack: 1 - Closed systems:0.